1. The team of KUSHIDA, Mascara Dorada, Jushin "Thunder" Liger, Tiger Mask IV and Ryusuke Taguchi def. the team of Yohei Komatsu, Sho Tanaka, Juice Robinson, Jay White and David Finlay Jr.
- Takaaki Watanabe interfered on Naito's behalf during the match, making his return to NJPW. 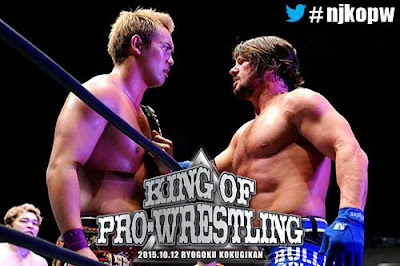 We're getting closer and closer to NJPW's big Wrestle Kingdom 10 show in January, and the card is slowly taking shape! What do you think of the results? Let us know in the comments section below!